The location of mills was determined by many factors. Jean Anderson has demonstrated in her paper elsewhere in this issue that a mill prospered if it was located on a ford and especially if it was located near the junction of both a river crossing road and a river parallel road. The location of both fords and mills is con­trolled by the geology of the area. I do not believe that a person who set out to con­struct a mill considered the local geology in selecting a site. Instead he looked at the “lay of the land” around the river and chose a site for a dam, headrace, mill, and tailrace based on the (1) slope or gradient of the river which controls the length of the headrace, the height of the dam, and the size of the mill pond, (2) the width of the river which controls the width of the dam, (3) the availability of local rock for construction of the dam, and (4) the presence of a good ford so that customers from across the river could use the services of the mill. All of these factors are controlled by the geology of the area. The Eno River in Orange County and western Durham County is in the Piedmont upland (Figure 1). The rocks of this region are metamorphosed volcanic ejecta including ash, lava flows, and associated marine sedimentary rocks. These rocks in turn have been intruded by numerous igneous bodies including granite batholiths and various irregular intrusives of felsic and mafic composition (Alien and Wilson, 1968). The structure of these rocks is complex. Locally they have been strongly folded and turned up on edge. The general age of the Piedmont meta-sedimentary rocks and some associated intrusives is near 600 million years (Cloud and others, 1976). In Durham County, from West Point to the junction with the Flat River, the Eno flows in the Durham Triassic Basin. The rocks in this area are sedimentary in origin and consist chiefly of sandstone and shales with some conglomerates. These rocks were deposited about 200 million years ago (upper Triassic time) on the floodplains and in the channels of ancient streams (Reinemund, 1955). Locally these sedimen­tary rocks are intruded by diabase, a mafic igneous rock. The intrusions are mostly in the form of dikes, but there are a number of nearly horizontal sills in the Durham Basin both to the north and south of West Point (Wilson and Carpenter, 1975). Figure 1. 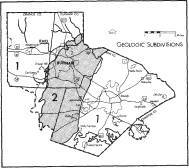 The geologic subdivisions of the Orange, Durham, Wake, and parts of Chatham and Johnston Counties. The stipple area labeled 2 is the Durham Basin, and the non-pattern areas labeled 1 on either side is the Piedmont upland. 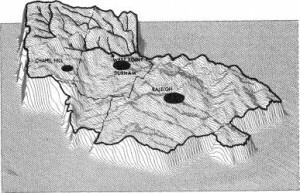 From Map III E.I in Triangle J 208 Areawide Water Quality Management Plan, 1976. The youngest rock in both the Pied­mont upland and the Durham Basin is the alluvium of the Eno River and its tributaries. This sand, gravel, and finer silts and clays is found to some extent along both sides of the river and on the adjacent floodplains. The Piedmont upland and the Durham Basin are both expressed topographically (Figure 2). The harder igneous and metamophic rocks of the Piedmont upland are a little more resistant to erosion than the softer sedimentary rocks of the Durham Basin. Consequently the Piedmont has an average elevation that is higher than the adjacent Durham Basin. Further, there is a rather sharp topographic between the Piedmont and the Durham Basin (Figures 2 and 3). This topographic break is clearly seen on Snow Hill Road in Durham County and on Kerley Road at the Durham-Orange County line. The Eno River flows from the Piedmont upland into the Durham Basin. The point of entry of the river into the basin is at West Point (Figures 2 and 3). The dif­ference in general elevation between the Piedmont and the Durham Basin affects the Eno River. Because the Basin is low, the river must cut down its valley in the adjacent Piedmont upland in order to enter the basin without going over a water­fall. This downcutting by the Eno has resulted in a V-shaped profile to the river valley (Figures 4a and 4b). A V-shaped profile is characteristic of a river that is cutting down and deepening its valley. Generally the Eno River in the Piedmont upland has little or no floodplain. The lack of a broad continous floodplain is characteristic of a river cutting downward. Locally there may be a small floodplain especially behind very resistant layers of rock. These resistant layers form a local base level that prevents the river just behind the base level from deepening its valley. Under these circumstances the river may develop a narrow floodplain. Downstream from West Point where the Eno flows in the sedimentary rocks of the Triassic Basin, the river meanders and occupies a much broader valley (Figure 4c). The river is not cutting down as much as it was in the Piedmont, and the sedimentary rocks over which it is flowing are soft and easily eroded. The river is able to open up a much wider valley and develop a wide floodplain. This difference in character between the Eno in the Piedmont and the Eno in the Durham Basin is reflected in the gradient of the river. In the Piedmont from Cole Mill Road to Roxboro Road, the Eno has a fall of 16 feet for each mile of flow (Figure 3). This is an average value for the drop of the river. Locally behind a resis­tant layer of rock the gradient is lower and at a rapids the gradient is higher. In the Durham Basin between Roxboro Road and the Old Oxford Highway the average fall of the river is 4.6 feet per mile (Figure 3). This lower gradient causes the large bends and meanders in the river where it flows in the Durham Basin (Figure 3). A river will not meander unless it has a reasonably gentle gradient. However, it should be noted that the Eno has slightly entrenched its channel in the Durham Basin. Consequently some of the Floodplain is no longer subject to inundation and should properly be referred to as a river terrace. Topographic cross-sections (vertical exaggeration of 20) of the Eno River valley. Sections a and b are in the Piedmont upland, and section c is in the Durham Basin. The location of the sections is shown on Figure 3. The people who selected the mill site were somehow aware of the difference between the Eno in the Piedmont upland and the Eno in the Durham Basin. Along the Eno in the Piedmont below Hillsborough there were about 15 mills, butalong the Eno in the Durham Basin there were only two mills (Figure 3). Where the river flows in the Piedmont upland it was “easy” to build a dam because 1) hard rock was available where the river has cut down through the soil and weathered rock to expose the fresh, hard igneous and metamorphic rock in the bed of the stream and in the adjacent walls of the V-shaped valley, (2) the dam could be placed on hard rock in the stream bed and could abut against the solid rock inthe valley walls (dams often fail where placed on soft rock or alluvial fill), (3) thedam could be short because the river flows in a narrow confined valley, (4) the higher gradientofthe Eno meant that the headrace did not have to be long in order to maintain the necessary “head” or fall of the water between the dam andthe mill wheel, (5) the higher gradient also meant that for a given height of the dam, the millpond would be smaller and would not necessitate the purchase of as much landon either side of the river to contain the pond, and (6) the hard rock in the river bottomwould con­tribute to the location of a favorable ford. In the Durham Basin below West Point, the dams would be more difficult to build and to maintain. In fact, Jean Anderson notes in her paper mentioned previously that Paul C. Cameron complained about the maintenance costs oftheNew Mill and its dam. The problems in the Durham Basin are essentially the reverse of the condition in the Piedmont. There is a lack of largehard rock to buildthe dam. The New Mill dam was built from local, relatively small boulders from the igneous (diabase) sill in the area. The river lacks solid rock for the dam abut­ments. Consequently the dam could easily wash out. The low gradient of the river meant that in order to have a short headrace it was necessary to have a relatively high dam to get the necessary fall of the water between the dam and the mill wheel. Another factor contributed to the location of some mills and mill dams in the Piedmont. One example is Cabe Mill (the remains of the mill and the headrace are in the Eno River State Park just north of Howe Street in Orange County near the Durham County line). The mill is located on the edge of a small floodplain developed upstream from a resistant layer of rock that functions as alocal baselevel. The mill dam is located some 1000 feet upstream on another resistant layer. The long headrace is dug in the soft sediment of the floodplain. The headrace is longer than most headraces of mills on the Eno. The longer headrace is necessary in order for the water to flow to the mill on the edge of the floodplain. The advantage of such a construction plan is not clear to this writer, but the headrace was relatively easy to dig because it is in the soft alluvium of the floodplain. Most mills on the Eno were located in the Piedmont upland and only two were in the Durham Basin. The cross sectional profile of the river valley in the Piedmont upland is typically V-shaped whereas the profile in the Durham Basin is much flat­ter and there is a wide floodplain or terrace. The gradient of the Eno is about 3 times greater in the Piedmont than in the Durham Basin. A higher gradient con­tributes to mill location because of a shorter headrace and a smaller mill pond. There is much rock in the river and adjacent valley walls in the Piedmont upland. This rock is available for dam construction and contributes to a good dam foundation as well as to the formation of a ford. I realize that a water mill can be constructed just about anywhere that water is available if one can cause the water to develop a head; that is, a difference in eleva­tion between the dam and the mill wheel. In the case of the Eno River, I think that local geology controlled or at least influenced the location of mills. Alien, E. P., and Wilson, W. F., 1968, Geology and Mineral Resources of Orange County, North Carolina: N. C. Dept. Conservation and Develop., Div. Mineral Resources, Bull. 81, 58 p.
Anderson, Jean, 1979, A community of men and mills; Eno, this issue. Browning, High Conway, “Valley of the Eno, some of its lands some of its people some of its mills:” unpublished manuscript. Cloud, Preston, ]ames Wright, and Lynn Glover III, 1976, “Traces of aminal life from 620-million-year-old rocks in North Carolina:” American Scientist, v. 64, p. 396-406. Reinemund, J. A., 1955, Geology of the Deep River Coal Field North Carolina: U. S. Geol Surv. Prof. Paper 246, 159 p.
Triangle J 208 Areawide Water Quality Management Plan, Inventory of Existing Resources: Triangle J Council of Governments, Research Triangle Park, N. C., 1976. Wilson, W. F., and P. Albert Carpenter III, 1975, Region J._Geology: A Guide for North Carolina Mineral Resource Development and Land Use Planning: N. C. Dept. Natural and Economic Resources, Mineral Resource Section, Regional Geology Series I, 76 p.